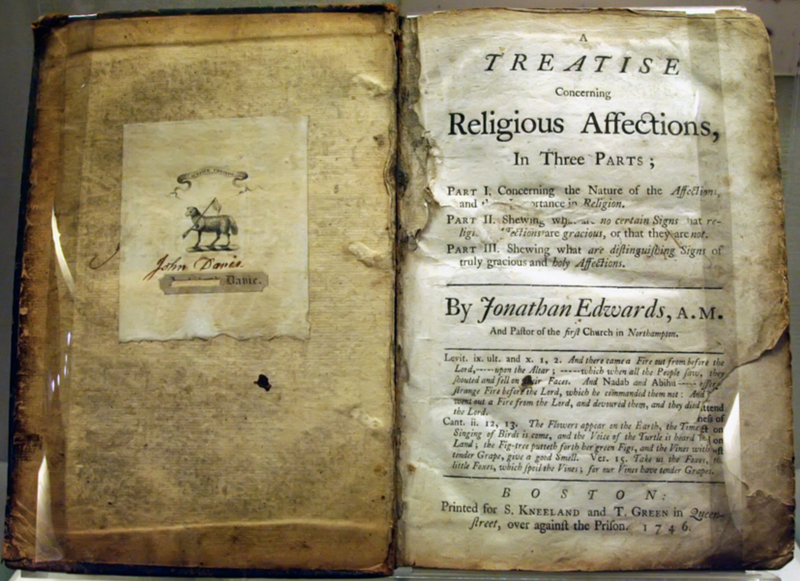 Jonathan Edwards’s A Treatise Concerning Religious Affections (1746) is considered one of the great classics of evangelical literature. What is the thesis of the book? “True religion, in great part, consists in holy affections” (95). What does Edwards mean by “affections”? the inclination or will (by which the soul is inclined or disinclined, pleased or displeased, approves or rejects). The affections have to do with the second faculty. Affections, according to Edwards, are “the more vigorous and sensible exercises of the inclination and will of the soul” (96). What is the difference between an “emotion” and an “affection”? Affections are more than emotions, though not less. Certainly there is what may rightly be called an emotional dimension to affections. Affections, after all, are sensible and intense longings or aversions of the will. Perhaps it would be best to say that whereas affections are not less than emotions, they are surely more. Emotions can often be no more than physiologically heightened states of either euphoria or fear that are unrelated to what the mind perceives as true. Affections, on the other hand, are always the fruit or effect of what the mind understands and knows. The will or inclination is moved either toward or away from something that is perceived by the mind. An emotion or mere feeling, on the other hand, can rise or fall independently of and unrelated to anything in the mind. Are the affections essential to godliness, according to the Bible? They would deny that much of true religion lies in the affections, and maintain the contrary, must throw away what we have been wont to own for our Bible, and get some other rule, by which to judge of the nature of religion (106). In his book, Edwards is attempting to help readers in this distinguishing, approving, and rejecting task. What are some of the uncertain or insufficient signs of truly gracious affections? What are the signs or marks of true, gracious, holy religious affections? What books give help in unpacking the arguments of this book? For wider historical context, see Thomas Kidd’s The Great Awakening: The Roots of Evangelical Christianity in Colonial America.